TEARLINER – “Young Racer.” Eun Chan on her scooter. THE MELODY – “Goodbye.” Han Sung and Yuju. MILVA – “Tango Italiano.” Jajangmyun eating contest. FREE TEMPO – “Immaterial White.” Yuju and Han Gyul walking by streetside peddlers. KIROTS – “청소슝슝” (cleaning). Eun Chan’s cell phone. DEPAPEPE – いい日だったね (ii hi datta ne / It was a good day). Eun Chan eating ice cream with Han Sung. JULIE LONDON – “Fly Me to the Moon.” Han Sung’s place. LOVEHOLIC – “화분” (hwabun / flowerpot). Han Sung’s memories of Yu Ju. BLUE KNIGHTS – “Red Night.” Eun Chan shopping for clothes. BLUE KNIGHTS – “Copacabana.” Blind date fake-out kiss. TEARLINER – “아이들” (children). Taekwondo kids. 유희열 (Yoo Hee Yeol aka Toy) – “라디오천국” (radio cheon-guk / radio heaven). Running in the rain with toys. 현경과 영애 (Hyun Kyung and Young Ae) – “그리워라” (geu-ri-weo-ra / yearn). The vinyl song that both Han Gyul and Eun Chan’s father owned. CASKER – “Mocha” (on OST). Han Sung and Yu Ju goofing around. TEARLINER – “Novaless.” Han Sung and Yuju. TEARLINER – “Regretto.” Milk delivery. 나윤선 (Na Yoon Seon ) – “그리고 별이 되다” (geu-ri-go byul-i dwe-da / and it becomes a star). Yu Ju sings this to Han Gyul over the phone. TAKE THAT – “Back for Good.” Cafe, Han Gyul and Yu Ju. LEE SEON KYUN – “바다여행” (Ocean Travel). Han Sung sings to Yuju. NATALIE COLE – “This Will Be (An Everlasting Love).” Princes prepare the café for opening. BELLE EPOQUE – “May.” Han Gyul dances for Yuju. DAVE KOZ – “Cuban Hideaway.” Eun Chan versus Min Yub. KULA SHAKER – “Hush.” Basketball scene. THE WANNADIES – “You and Me Song.” Fountain. THE MELODY – “Polly.” Eun Chan and sleeping Han Gyul. INGER MARIE GUNDERSEN – “Sad Song.” Han Sung with Yuju on couch. “올챙이와 개구리” (tadpole and frog). This is the children’s song Eun Chan sings. TEARLINER – “밤나무빛슬픔” (Piano ver.오수경). Roughly translates to “sadness of the light of a chestnut tree,” Han Gyul and Eun Chan outside. TEARLINER – “Raincoat.” Eun Chan cries on bus. FORTUNE COOKIE – “헛소동” (much ado about nothing). Sun Ki looking for his old love. AS ONE – “White Love Story.” Ending scene. MNI민재 – “For a while.” Han Sung drives Eun Chan. MAXIMILIAN HECKER – “I’ll Be a Virgin, I’ll Be a Mountain.” Yu Ju and Han Gyul while away their day. TEARLINER – “Wishy-Washy Boy.” Eun Chan on drums. NO BRAIN – “넌 내게 반했어” (You’ve fallen for me). This is what Eun Chan and Han Gyul sing on the street before going to the fountains. BASEMENT JAXX – “Do Your Thing.” Eun Sae auditions. “Heart and Soul” – This is the song Eun Chan and Han Sung play together on the piano. LUCID FALL – “보이나요” (Does it show?). Han Sung’s ringtone. THE MELODY – “Love Box.” Han Gyul with his grandmother. LOW-END PROJECT – “연애를 망친 건… 바로 나라는 걸 알았다” (I know I’m why the romance failed). End scene. 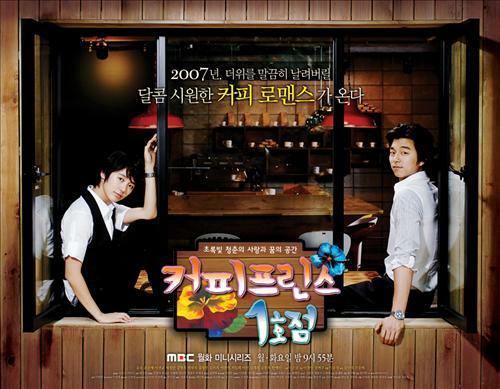 KINGS OF CONVENIENCE – “I Don’t Know What I Can Save You From.” Yu Ju and Eun Chan in cafe. ARCO – “Perfect World.” Yu Ju and Han Sung. ROD STEWART – “Have I Told You Lately.” Supermarket. BLUEDAWN 푸른새벽 – “Last Arpeggios.” Walking on the beach. AZURE RAY – “Across the Ocean.” Han Gyul watches Eun Chan sleep. KIM YEON WOO 김연우 – “나는 사랑이 뭔지 모르나봐요” (I must not know what love is). Eun Chan and Han Gyul spend their day separately. ARCO – “Alien.” Played in Han Gyul’s car. “Jave Jive.” Sung by the Coffee Princes. TEARLINER – “Space Island.” Han Gyul and Yuju talk. 어른아이 (Adult Child) – “Sad Thing.” Last scene. DJ GURU – “X x.” Han Gyul drives away from the cafe angry. BLUEDAWN 푸른새벽 – “호접지몽.” Eun Chan plays with toy in tears. 어른아이 (Adult Child) – “Make Up.” Last scene. CLOUD CUCKOO LAND – “다시” (acoustic). At café. FREE TEMPO – “Sky High.” Yu Ju’s ringtone. CLOUD CUCKOO LAND – “Coffee Is.” Last scene. BELLE EPOQUE’s “May” is the chestnut scene song. It is already posted under a prior episode. BLUEDAWN’s “Last Arpeggios” is in the park bench scene. Also posted previously. EPHEMERA – “Balloons and Champagne.” Eun Chan plays with block toys with Han Gyul on the patio. FANNY FINK – “좋은 사람” (good person). Yu Ju returns. CASKER’s “Mocha” is posted in a prior episode. Scene where Eun Chan draws signs for Han Gyul at his apartment. 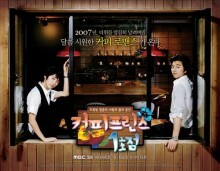 MYRRA – “Taxi Driver.” Han Gyul and Eun Chan at café. 어른아이 (ADULT CHILD) – “Star.” Dinner party. SONDRE LERCHE – “Once In a While.” Streetside and kids’ store. AQUIBIRD – “Different World.” Piggyback song. LOW-END PROJECT’s “연애를 망친 건… 바로 나라는 걸 알았다” plays while Han Gyul makes the paper airplane. It is posted in a previous episode. GENTLE RAIN – “The Night & Sweet.” Jazzy background song when Eun Chan has lunch with Han Gyul’s mother. BLUR – “Sweet Song.” Garden proposal. MISSING ISLAND – “Maiden Voyage.” Han Gyul’s imagined bed scene. YANNI – “Reflections of Passion.” Opening scene. PINEAPPLE – “이별전의 발렌타인” (“A valentine before farewell”). Han Gyul and Eun Chan at cafe. MISTY BLUE – “위로.” Eun Chan writes on leaf. DONAWHALE – “Running.” Eun Chan running to Han Gyul’s apartment. THE MELODY – “Paradise.” Last scene. REASON AVE. – “My Carol.” Breakfast on the patio. MAXIMILIAN HECKER – “Flower Four.” In car on the way to work. HAN DONG JOON – “너를 사랑해” (I Love You). The song Han Gyul sings. THE MONGOOSE – “Pintos.” Background song in previews at the end of each episode. Clique no botão abaixo para incluir Coffee Prince Song List - OST em sua lista de desejos.